↑ "East Sussex County Council" (PDF). 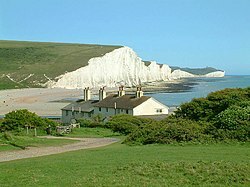 sevensisters.org.uk. ↑ "Atonement - Filming Locations". IMDb. สืบค้นเมื่อ 4 April 2011. ↑ "Harry Potter filming locations guide" (html). ↑ "Birling Gap and the Seven Sisters" (html). หน้านี้แก้ไขล่าสุดเมื่อวันที่ 10 กันยายน 2560 เวลา 08:12 น.